Blended with real juice. Just add water. Fruity and refreshing. 10 glasses full of refreshing fruitiness. Made with Cotswold spring water. No artificial flavours, colours or sweeteners. 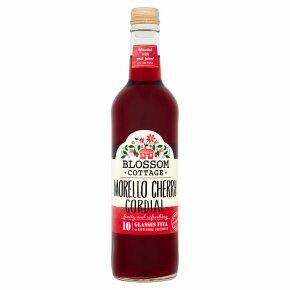 Made in the heart of the Cotswolds with succulent Morello cherry juice and spring water, creating a delicious and refreshing cordial. Dilute 1 part cordial to 4 parts water. Liquid colour may vary due to using only natural ingredients.